I did not have a chance to say anything at the awards banquet Saturday evening in Lawrence. 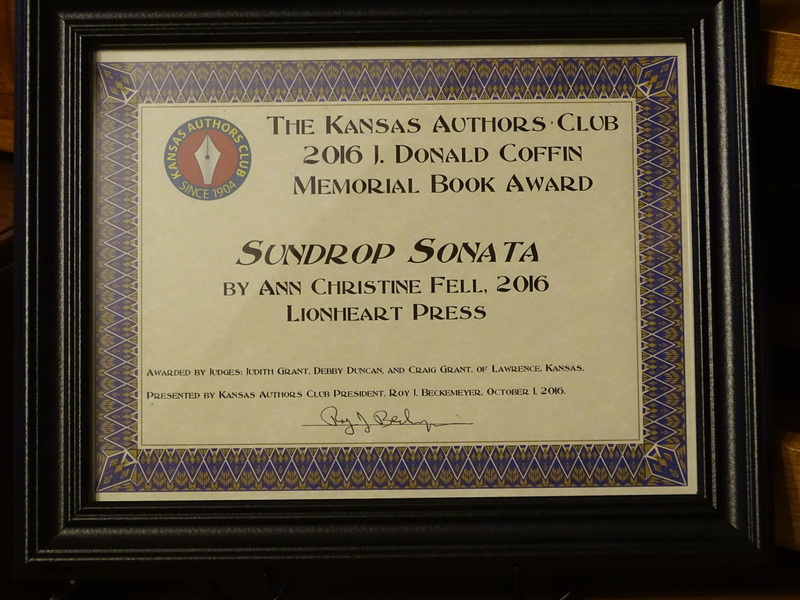 Ronda Miller gave a nice introduction and then handed me the certificate for the 2016 J. Donald Coffin Memorial Book Award. 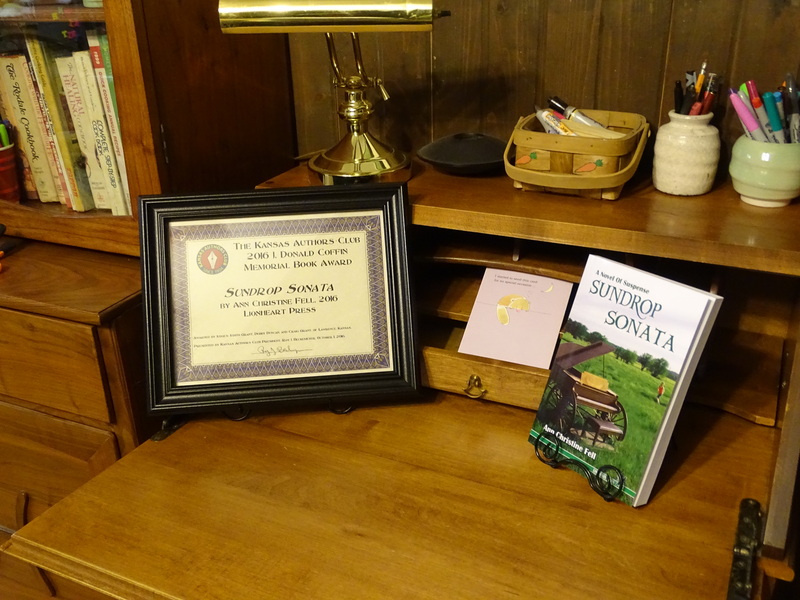 The J. Donald Coffin Award is intended to honor the best published book written by a member of Kansas Authors Club, within the last two years. This annual award is determined by independent judges who read the books submitted for consideration. The trio of judges this year had this to say about Sundrop Sonata. I am always amazed at the doors that open when I follow my dreams. At one point in my life, decades ago, I would have described myself as the world’s shyest person. I could not have dreamed of a moment like this. It just wasn’t possible. Even answering a question aloud as a high school student had my heart pounding so hard, I could hardly say a word. But I could write them. Then I learned that life is short, and when opportunity knocks, you better respond, even if it goes against the core of your being–even if it’s the hardest thing in the world for you. And once I took that step, the doors opened. Writing frees my soul. I’m never happier than when I’ve wrung the words to a particularly vivid scene onto a blank page. But then I found that after I wrote a book, people began asking me to speak. Imagine that. Me, the shyest person on earth. However, the rewards of stepping out of my box, of trying something new, can be very worthwhile. It’s invigorating to meet folks who relate to experiences I have had, who know what it’s like, who are opening doors of their own. I am not the first person to note that it takes a village to write a book. KAC is an important part of my village. Friends who write can offer each other valuable support, critique, and encouragement. I have learned a lot listening to honest suggestions from my writing friends. And I’ve learned even more reading their drafts and offering ideas to polish their work. Thanks to my family, several of whom attended the banquet with me. My sister—traveling across two states to attend the banquet. Cousins who opened their home to host the family this weekend. Special thanks to my husband, for offering ideas and tips in his specialty areas, for putting up with me and my crazy schedule, and for clearing his schedule to attend the banquet with me. He brought our live-in grandson along—thanks to the little guy for helping me in his special 6-year-old way. You are heartily welcome! I value your friendship as well.